So as not to re-post it, I just blogged about diapers in my other blog. 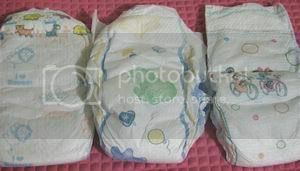 And hopefully, Huggies Dry Comfort has really changed their design (center) because it is really cuter. Some Moms I know buy in Divisoria. I don't know where exactly but they supposedly get these at factory prices... they even get other variants from abroad there. Some will even offer delivery (like Mom Massage's Dial-A-Diaper service). My wife switches diaper brands. She usually goes for the cheaper ones for baby during the daytime then uses the more expensive brands when we go out and also for sleeping time. Once, she tried the cheaper ones for nighttime use and it was so thoroughly wet by morning that it leaked onto the bed!